Your holiday is important to you, and it’s important to get it right. Finding the best child friendly resort in France needs a bit of research, so here goes. Please enjoy our little guide. There are probably a million and one resorts describing themselves as “child friendly” in France. But before you plump for a particular one because it has charming blue shutters and has a high chair, take a look at our guide below. You’ll realize that there’s quite a lot to consider before clicking on book now! France is a big place. For starters, it spans several climate zones so why not begin by choosing some weather for your holiday. If you aren’t too fussed about grey skies and rain however, you are free to enjoy any region of France. As you might expect, the further north you go, the worse the weather. So a gite in Normandy or Brittany – or anywhere north of the Loire Valley – will offer weather broadly similar to the UK. But let’s be honest, with young kids in tow, do you really want to be stuck indoors counting raindrops on the windows? If warmth and sun are important to you, head south to the Mediterranean. From the Italian border to the Spanish frontier, France offers a narrow stretch of coastline blessed with lovely warmth and sun. The Roussillon area around Perpignan enjoys around 300 days of sun per year. Next big decision. If you ask the kids for a preference between country and beach, what do you think they’ll say? Yep, it’s likely to be the beach every time. Of course you can do both. Just find a place which is in the countryside yet less than 10 minutes drive to the coast. This is really important. Many child friendly resorts glibly tell you that they are “just” 40 minutes or more from the beach. Forty minutes! That 80 minute round trip takes a big chunk out of your day – wouldn’t you rather spend that time actually on the beach? Can I actually get there? This is so important, and often overlooked until it’s too late. Let’s say you’ve discovered a fabulous child friendly resort. It’s got great Tripadvisor reviews, lots of photos of happy families on the website. Brilliant – let’s book it! But hang on a second… Check out the flight routes and airports before you go any further. There’s a good chance you’ll have a very limited choice here – often a tiny regional airport which is almost certainly held hostage by Ryanair. We would recommend booking a resort with a choice of at least 3 airports and 3 airlines, to give you decent options of airline, price and date. Remember that a restricted choice of flights also means restricted car hire choice too. Ultimately this leads to you paying a higher price for both flights and car. Think a bit more broadly and you’ll get better value. How about a two-centre holiday for example? We have many guests who fly into one airport then out of another. For example, they arrive at Perpignan (South of France) and hire a car for their holiday at Imagine Roussillon. They then drop the car at Perpignan train station and take the high speed TGV to Barcelona (80 minutes) to enjoy a Spanish city break before flying home. Let’s take stock for a moment here. You’ve plumped for sunny weather and you want to be near the beach. You are also determined to have a good choice of travel options to get you to your destination and back. The major operators may well describe themselves as child friendly but will also have singles, couples and older people on site. Such guests may or may not be welcoming to your young kids, and the establishment as a whole most certainly won’t be totally geared exclusively to your needs as a young family. So let’s narrow down to those resorts who offer holidays only to families with young children. Generally these are small family-run complexes. Here’s a quick and easy way to weed out the worst establishments. Ask them if their complex is 100% fenced and gated the whole way round. If it isn’t, don’t stay there. How can you possibly relax with young children if you’re constantly worried about them escaping? Second, check that the pool area is fully fenced and gated too. An alarm simply won’t do. Ask what baby equipment is available – socket protectors, monitors, bed guards and so on. If it’s not freely available – and free- walk away. Also check that the owners live on site. Someone popping in every day to answer questions just isn’t good enough. You need the owner to be there to deal with emergencies. You have the right to be demanding. If you feel that you are making too many compromises with your child friendly accommodation, maybe they’ve forgotten to make it parent friendly too? Here’s a few pointers to what you deserve to expect. All holiday apartments need a certain specification to allow you to enjoy a comfortable vacation. Air conditioning has to be high up on this list. You need it in hot places, so make sure it’s included. Even if it is, ensure that you won’t be landed with some dodgy, rattly units that are so noisy that you can’t sleep. And don’t underestimate the power of the washing machine! You can pack half the amount of clothes and just do a wash mid-week – genius! Now this is a facility like no other, yet it’s as rare as hen’s teeth in small resorts. An old fashioned “play barn” where the owners dump their own children’s old toys simply won’t do. It needs to be staffed and operated to a high standard. Kids clubs are expensive to operate, which is why many small resorts avoid them. 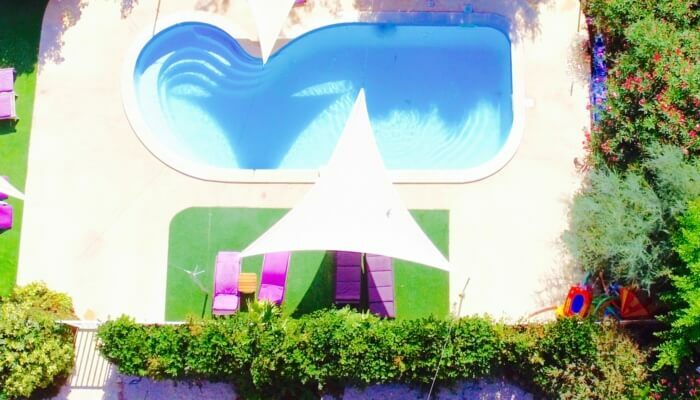 But they can make a huge difference to your holiday, by enabling your children to enjoy structured play whilst you relax by the pool. In a hotel you get a great pool complex, so demand it on your specialist child friendly holiday too. Ask for two pools not one! And you want them heated to a decent temperature. At this point, watch most resort owners run for the hills! I suppose it would be too much to ask for a fitness centre with daily classes, a gym and a massage studio? Imagine Roussillon offers these as standard, but even our countryside competitors who charge eye-wateringly high prices just can’t match our fitness facilities. This can make a huge difference to your holiday. Kids are demanding, so sometimes you need a little bit of time to yourself. Imagine a place where restaurants are booked for you and itineraries offered! Where personalized running routes or personal training programmes are always available – for you personally. We hope our little guide has been helpful. 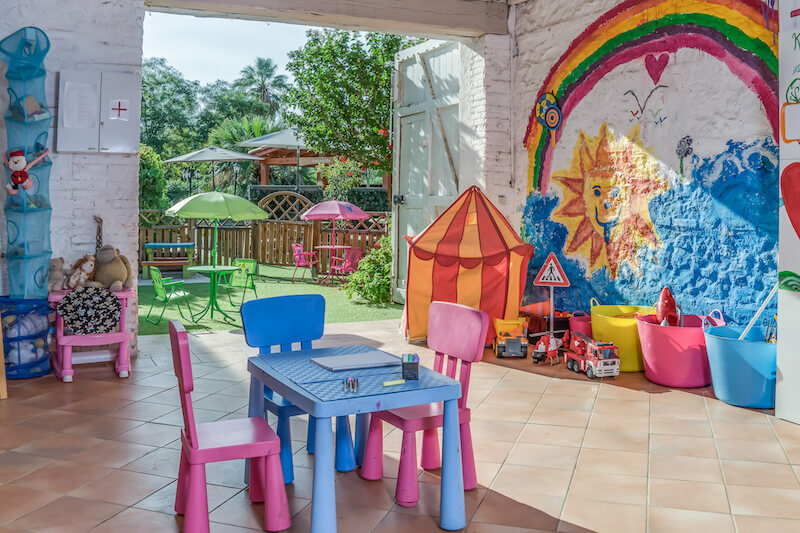 We want you to be able to choose a great child friendly holiday and obviously we’d love it to be here with us at Imagine Roussillon!